*Cover and refrigerate for 4 to 6 hours, or overnight. Prepare a 9 inch springform pan by lightly greasing the edges of the pan with cooking spray, then wiping gently with a paper towel. Grind the cookies into fine crumbs using a food processor or blender. In a microwave-safe bowl, microwave the butter for 45 to 60 seconds until the butter is melted. In a separate medium-size bowl, pour the melted butter into the cookie crumbs and stir until there are no dry crumbs left. Pour the crumbs into the pan and press firmly into the bottom and up the sides to create a thick crust. In a large mixing bowl, beat the cream cheese at low speed for 30 seconds with the whisk attachment to eliminate any lumps. Increase the speed to medium and slowly start adding the heavy whipping cream, about 1/4 cup at a time. The idea is to slowly add the heavy whipping cream so that the cream cheese will not be lumpy. It should resemble a liquid consistency. Once all of the heavy cream has been added, increase the speed to high until the mixture becomes bubbly. Slowly add the powdered sugar and continue beating until stiff peaks form. Turn off the mixer and spoon the Nutella into the mixing bowl. Beat the Nutella into the whipped cream slowly at first, and once it starts to mix increase the speed to medium-high and beat for 30 seconds or until stiff peaks form again. Prepare the whipped cream by placing the mixing bowl and whisk attachment in the freezer for 5 to 10 minutes to chill. Pour the heavy whipping cream into the chilled bowl and use an electric mixer to beat the heavy cream on medium-high speed until the cream get bubbly. Slowly add the powdered sugar and continue beating on high speed until stiff peaks form. Remove the sides of the springform pan. Sprinkle the top of the pie with peanuts and drizzle on some of the caramel. Pipe the whipped cream in a large circular motion, creating 10 or so peaks of whipped cream near the edge of the pie. 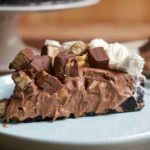 Chop the snickers bars into smaller pieces, placing a small piece of each whipped cream peak, and then pile the remaining snickers in the middle of the pie. Drizzle with the remaining caramel. I suggest freezing this for 20-30 minutes before slicing. This will help ensure a cleaner slice. Also, I suggest using a clean, sharp knife to cut.